Kids have great imaginings about the books they read or have been read to them. Cartoon characters they have seen on television. They often fancy themselves as their favorite character. Boys in particular love to play super heroes or even villains and act accordingly. They may even like Peter Pan or Captain Hook whichever character gets their interest the most. They love to imagine and play around. We are certain that you would only want to make your little pirate happy in every way you can. One way of doing it is by giving him the room that he begs for. It is true that nowadays it is not a challenge to give this enchantment to your child. There are different shops online and local that offer themed bedroom furniture and accessories. You just need to be very specific as to what theme you are up to and a help from your little man will do the trick. Ask him what he wants and honor his opinion. This little man has a say, after all it’s going to be his wonderland that you are going to create. 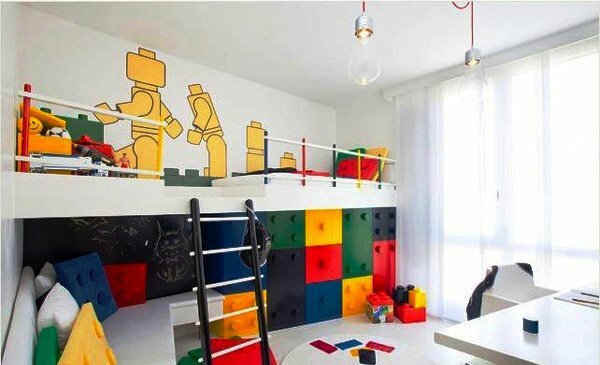 Below are 15 boys themed bedroom designs that will definitely help in choosing the right theme for your little boy. 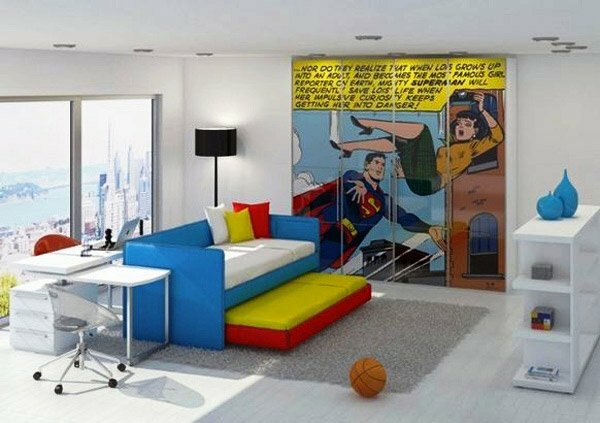 A great piece of art and functionality has been created in this one of a kind themed bedroom design. 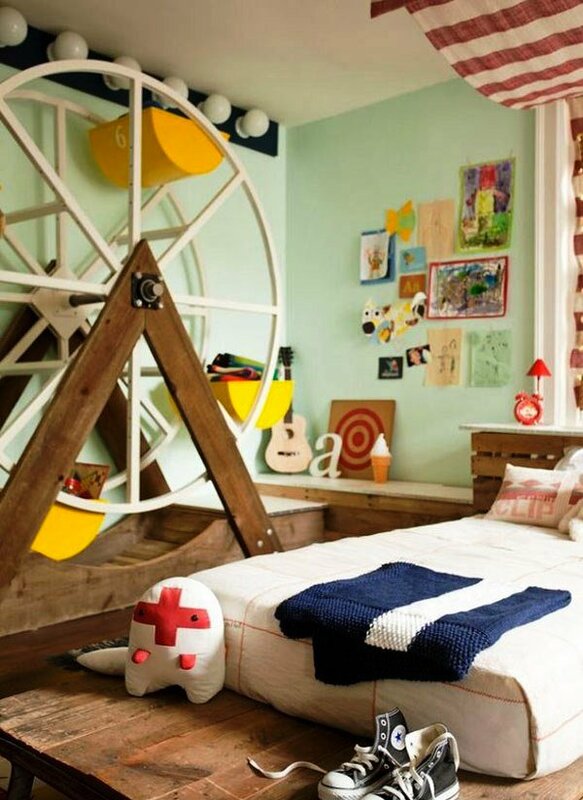 The Ferris wheel as the focal point encourages fun and at the same time provides storage room for your boys’ toys and other stuff. Kids adore all kinds of vehicles they have seen either on books, mass media or in their everyday life. They are amused by how it is built and how it works. So if you have a kid that is a vehicle-enthusiast then this design might just be right for you. 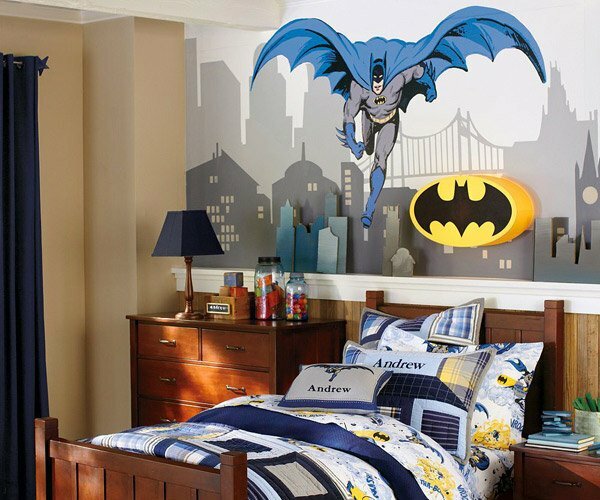 Create a Batman themed room for your little boy and he may just shower you with hugs and kisses of appreciation. 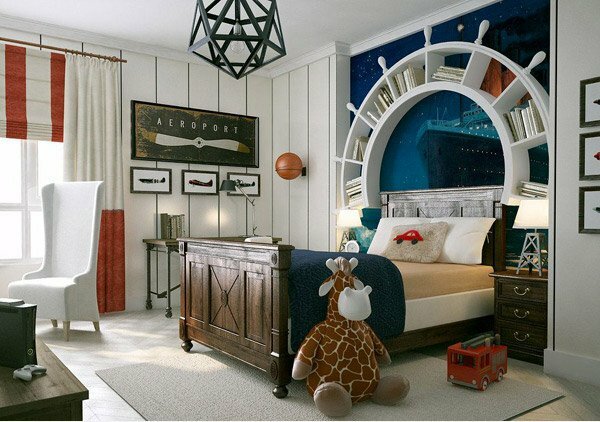 We love the boat beds in this design and every accessory that says one thing –nautical theme rocks! Is your kid a huge football fan? We bet this bedroom design is something he will surely love. 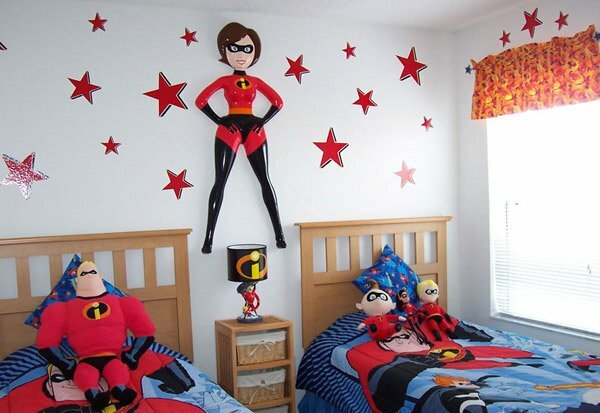 An Incredibles themed bedroom that a child and a child at heart will amazingly enjoy! So he loves superman, give him the superhero that he badly wants without going overboard by incorporating this statement poster on his wardrobe. It’s bold and colorful and is a very interesting focal point in the bedroom. If your kid just cannot get enough of the outdoor atmosphere and loves to play all day long, you might just want to pick this theme for him. Don’t you just love to live in Lego land? 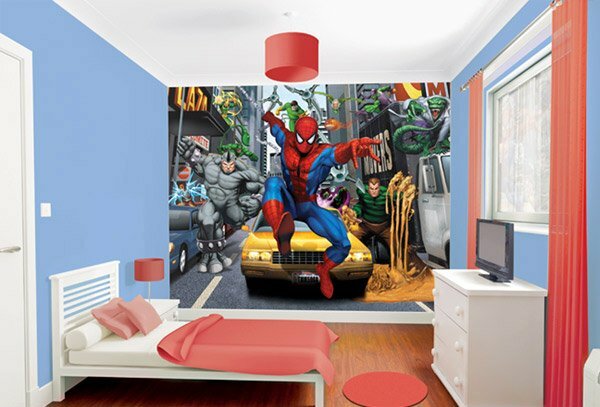 A boy with a great fascination of Spiderman will surely love this bedroom design. A great wall mural of his favorite character is sure to feed your little superhero’s fantasy. 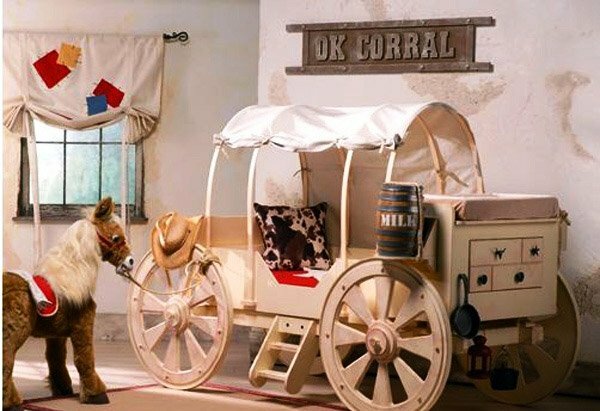 Give your boy some Western flair by creating a cowboy ambiance to his bedroom. The fun never stops in this Italian-style speedway pit stop. Bring vibrant to your child’s bed and closet room with your imagination and your child’s fancy. This design was created for an 8-year-old wrestling fanatic. You could also cop this idea if your lad is a WWE fan, this design will make his dream come to life. Let his favorite sports speak for him. 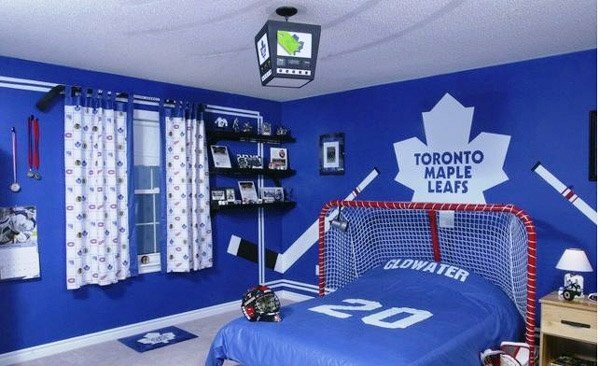 The use of a unique headboard for his bedroom is just one way in keeping the game alive in his own space. 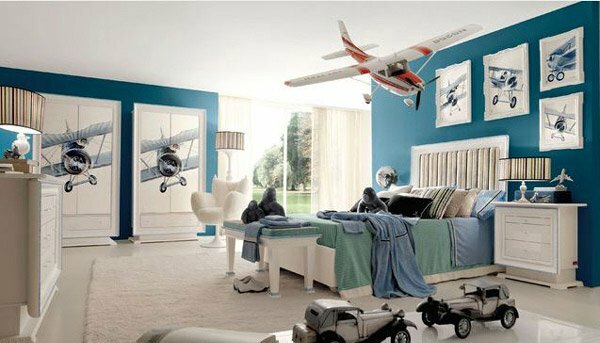 The mixture of calm colors makes this retro-aviation themed bedroom suited for a growing boy. 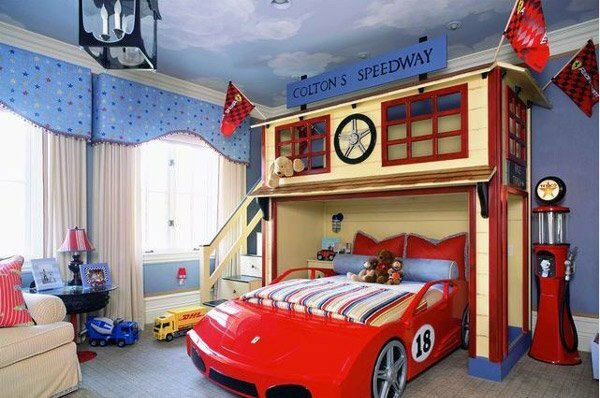 These bedroom designs are noting but haven to your little angels. 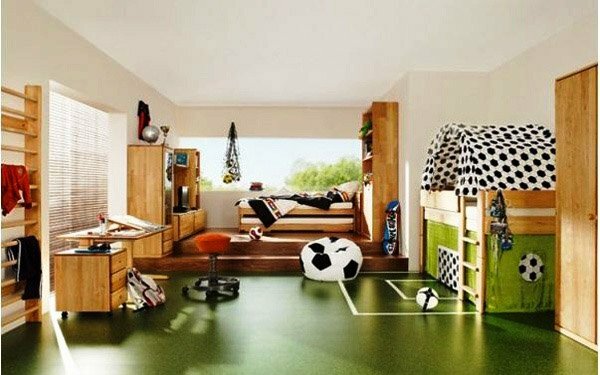 Think about the joy that you could bring to your little ones if you incorporate their favorite super heroes, sports and fascinations to their own space. You might think that it is difficult to come up with all of these decorations but the truth is it’s just pretty easy. The best thing to do is to include them in designing their own bedroom. Materials to use in creating such will be available for you anywhere you look. You could go for posters or wallpapers for an easy change of theme once they outgrew the design. You could be adventurous and look for unique pieces of bedroom accessories or bed to create a greater impact on the theme you are working on. 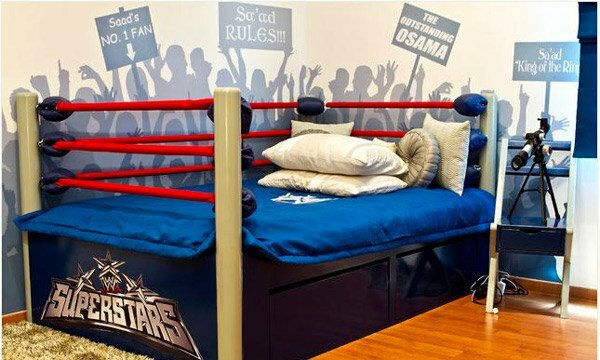 The means on how you can make your boy’s bedroom standout and loved for a long time are endless. And this article is just one way of helping you to come up with an idea of your own. We hope you enjoyed it as much as we did.